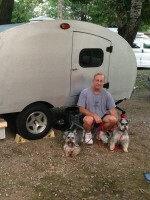 Teardrops n Tiny Travel Trailers • View topic - Fold-down loft for a child? Fold-down loft for a child? I am almost done constructing a fold down loft for my 2 yr. old and wondered if anyone had done the same. Any ideas? I feel bad for anykid thats going to be cramped up in a tear with his parents. I understadn the need. What is wrong with me that I can NEVER understand these diagrams? derekxcole wrote: I feel bad for anykid thats going to be cramped up in a tear with his parents. I understadn the need. What about the parents cooped up with their kids? I did a similar thing, but mine is for a 6' 3" 15 year old. I was thinking about this myself for my small cabin configuration. I just didn't know exactly where, how, or whether it was just asking for trouble, especially since I planned on using a side tent anyway. My fall back plan is to use (attempt) some sort of hammock that can just be hooked on, in case I need to squeeze an extra body in there. The side tent will also be there in the future....gotta a baby on the way. I would like to see somebody do one of these on top of a teardrop. Integrate it into the design. Years ago the first few Teardrops I built for the galley only had a shelf on a drawer glide. Open the trunk lid, roll out the shelf put the stove on it and that was the galley. When it was in the "in" position and the trunk lid closed, we would make up my sons bed right on the shelf with a little foam pad. As I said that was years ago (1994)...now hes bigger than me. Thats what happens when ya start feedin' em. Last edited by len19070 on Fri Mar 03, 2006 1:43 pm, edited 1 time in total. fornesto wrote: I would like to see somebody do one of these on top of a teardrop. Integrate it into the design. I think we've discussed this trailer before and I think Gage knows about it - I just saved the photos from somewhere.